"Okay, I’m totally awesome, now just be careful upgrading, okay?" Photo (CC) Shawn Kinkade. 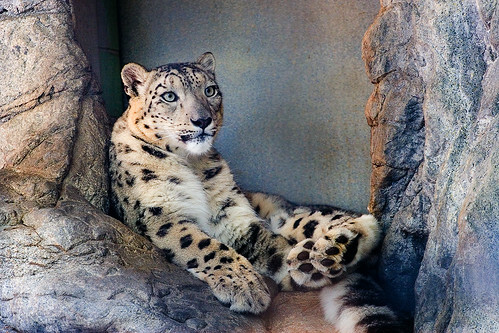 Snow Leopard is coming, but try to keep your cool. Naturally, the same advice holds true for would-be Snow Leopard visualist upgraders. Snow Leopard includes lots of improvements, but none of the known enhancements qualifies as “must-have” on this Friday. That is, upgrading is worth considering, but rarely on launch day. Of course, if you don’t have any gigs coming up, or if you’ve got more than one machine, or if you have the time to invest in mirroring a system and want to get a headstart on testing, upgrading may well be appropriate, so I’m doing our best to collect information about what is and isn’t working. Unfortunately, unlike Microsoft, which seems to allow open discussion of its OS by developers and publishes information many months in advance, Apple frowns upon any pre-launch discussion of technical issues – aside from pre-digested marketing materials. Happily, the window during which I can rant endlessly about this problem is about to close, at least for 10.6 – Friday is launch day. Vidvox VDMX b7.3.5 is tested and works properly on Snow Leopard. We expect more official information on Snow Leopard from Vidvox on Friday. Note that even this should be taken with a grain of salt, because until there’s a larger base of testers, a lot of bugs in any program simply won’t be known yet. At least two Resolume users have reported issues with Resolume Avenue, so if Resolume’s your tool of choice, you will definitely want to wait until you hear confirmed compatibility. The operating system itself has a lot of nice improvements, but visual applications will need to retain compatibility with 10.5 for the near future, so the upgrade should by no means be considered mandatory if you want a smooth transition. In fact, if you’re jealous of the smaller install size of 10.6, you can halve the size of your 10.3.9 or later install right now using Monolingual. The reason 10.6 is smaller is because it strips PowerPC code from binaries. So, give Monolingual a shot and you get roughly the same advantages (theoretically, more space reduction thanks to removing extra languages, hence the name). Hard-core users of tools like Quartz Composer may have reason to upgrade, but we’ll cover that in due course. Stay tuned. 1. There are subtle but significant changes in the new OS that will break things. Not break in a good way, but simply break as in broken. 2. Larger groups of users haven’t really tested the OS yet. 3. When those testers test the OS, they’ll discover those broken things. Someone has to do it. Then they get fixed. 4. There’s no massive advantage for visual applications to upgrading right away. So, do you want to be the people experiencing the broken stuff, or let someone else do it for you? You’re getting this OS upgrade thing now, right?